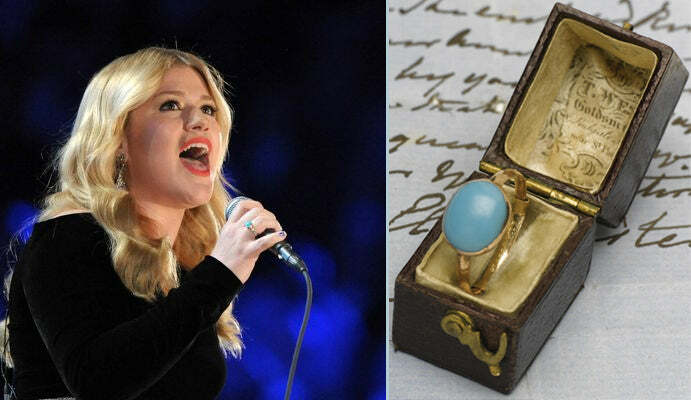 It looks like ‘American Idol” winner and pop star Kelly Clarkson is being forced to sell the rare, turquoise and gold ring that once belonged to esteemed writer Jane Austen. Clarkson paid over $230,000 for Jane Austen’s ring at from Sotheby’s during an auction earlier this year, which was over five times the reserve price of about $48,000. After Clarkson won the auction, the UK government issued a temporary export ban on the ring on grounds that the ring is closely connected to the history of Britain and can be considered a “natural treasure.” We discussed this ban in August when it was first issued. On Monday September 23rd, it was announced that Jane Austen’s House Museum had raised enough money to match Clarkson’s original bid. The museum was able to raise about $250,000. In turn, Clarkson has agreed to re-sell the heirloom to the museum. The ring had been in Austen’s family for 200 years until it went to auction this year. The ring is to be displayed at the museum, which is where Austen lived the last eight years of her life. She died in 1817. “The museum has been stunned by the generosity and light-footedness of all those who have supported our campaign to meet the costs of acquiring Jane Austen’s ring for our permanent collection,” said Mary Guyatt, curator of Jane Austen’s House Museum.